← Do I Need Trailer Winter Tires When Hauling in Cold Weather? Check out these unique but useful horse lover gifts that’ll be loved for the long term. What makes a perfect holiday present? It’s somehow both surprising and totally necessary. It shows that you truly understand the person you’re giving it to. And it makes their face light up as they rip the last shred of wrapping paper off and hold it up for everyone to see. Want to give that kind of present to your favorite horse lover this year? We’ve made it easy. Below, you’ll find more than a dozen unique, practical horse lover gifts that they’ll use and love for years to come. A boot box holds equipment that riders need in their horse trailers at all times. It’ll help keep their trailer organized and make it easy to find what they’re looking for. Blue Ridge Trailers offers a variety of boot boxes for both bumper pull and gooseneck horse trailers. A high-quality winter riding jacket, durable gloves or thermal breeches will be appreciated by any rider who hits the trails this season. Nothing gives a horse lover comfort and peace-of-mind like being able to keep an eye on their horses during a long drive. Here at Blue Ridge Trailers we specifically recommend Voyager trailer cameras, which we’ve found to be the most durable and reliable. This handy device gets mounted on the horse trailer walls. It can fold up for a rider to rest their saddle on and folds down against the wall when it’s not needed. 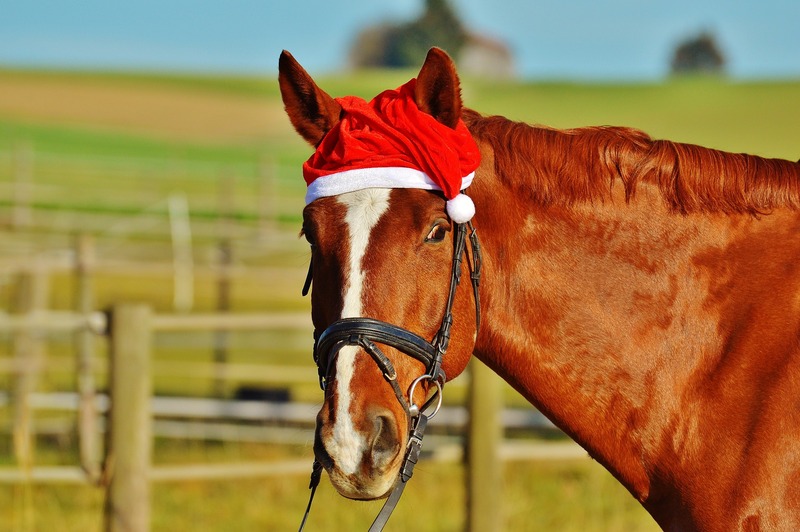 Here’s a low-cost gift that horse lovers can use every day. 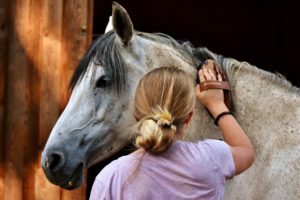 Depending on the horse owner’s needs, you can get a travel grooming kit, a kit for the barn, a small zip-up kit with just the essentials, and many other options. Here’s a gift that truly keeps on giving. 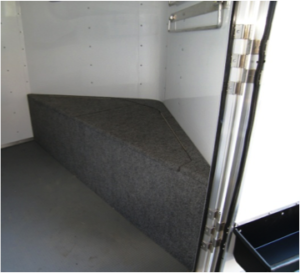 A cover protects the horse trailer exterior from the elements, which in turn protects the trailer’s resale value. Just be aware that most trailer covers are manufactured too short—look for RV covers instead. Read more about how to get a quality cover here. While we’re on the topic of protecting a horse lover’s gear, how about a saddle cover? Saddle covers are inexpensive and often have fun designs to let the rider’s personality shine through. If you want to make a horse lover happy, help make their horses happy. Trailer fans keep horses cool and comfortable on long drives. Ideally, trailer fans shouldn’t be dependent on the tow vehicle battery. Consider adding an auxiliary battery to run the fans independent of the tow vehicle. Make a rider’s life easier before every drive. Back-up cameras eliminate guesswork when hitching a trailer up to a truck. By looking at the camera monitor, the driver can quickly and simply line the truck up to the trailer ball. The exterior of aluminum trailers will oxidize over time, creating a dull or dingy appearance. A professional cleaning will safely remove the oxidation so the trailer looks shiny and new again. Blue Ridge Trailers has a professional on call that will make even the oldest trailer look bright again. Call us or contact us online to schedule an appointment. This powerful little device lifts up a trailer for easy hitching and unhitching, so riders can save their energy for the trails. 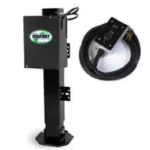 Contact us to learn more about this tool and the difference between an electric jack and an electric/hydraulic jack. You can’t get more practical than this! You can even get a tank with a pump that makes hosing off hot horses much more efficient, leaving more drinking water for them. If your favorite horse lover is still growing as a rider, this thoughtful gift will help them achieve their goals. Shopping for a horse lover or just looking for ideas? Blue Ridge Trailers is always happy to offer our expertise on the best horse lover gifts (and anything else horse- or trailer-related). Call us at (434) 985-4151 or view our accessories inventory, including a complete list of after-market accessories we offer.